El Tovar, Grand Canyon NP, 1985. El Tovar is a large hotel built twenty feet from the very edge of the south rim of the Grand Canyon. The building's foundation is rubble masonry and concrete. The superstructure is of wood frame construction. The first floor is sheathed with log slab siding complete with finely-honed corner notching that gives the appearance of log construction. The upper stories have rough weatherboards. Log-slab moldings surround the windows on the first floor; those on the upper stories have heavy, milled moldings. The building has multiple roofs at several different levels that add to its architectural interest, visual appeal, and spatial experience. At the uppermost level is the wood turret, wrapped in shingles and serving as the most important element of the identifiable silhouette of El Tovar. Directly below that is the hip roof with bracketed eaves that shelters the central portion of the building, including the lobby and mezzanine lounge. The three-story wings to the north and south that flank that central portion have mansard roofs pierced by dormers. On the north and south ends the roofs step down to two- and one-story terraces. The main entrance on the east side of the building has a gable roof with a hipped end covering the large entrance porch. Further architectural emphasis on the main entrance includes the L-shaped walls of stone masonry bordering the outside edges of the entrance porch. The original sign identifying the building as El Tovar and bearing the Tovar coat of arms hangs above the entrance stairs, supported by a peeled log framework. Porches on the canyon end have peeled log posts. The railings along all of the terraces and porches have jigsawn balusters cut in patterns reminiscent of Swiss chalet detailing. The upper terraces have tapered posts approximately 10 feet in height and topped with trefoils that separate the sections of low railing and provide additional interest to the building's silhouette. The large porch on the north end of the building has two attached gazebos at the east and west. The porch's lintel contains a quote from C.A. Higgins' "The Titan of Chasms" in wrought-iron letters reading: "Dreams of mountains, as in their sleep they brood on things eternal." An access ramp for wheelchairs was added to this north end of the building. At the southernmost end of the building the surrounding grade drops down to the hotel's basement level. The coursed rubble masonry walls of this end of the building contain arched openings similar to those in the stone corner wall of the entrance porch. The dining room, kitchen, and utility wing stretches out from the west end of the building. This wing has stone foundations, log- slab siding, and wood shingle roofs. The two stone chimneys on the north and south sides of this wing are flanked by large picture windows. The porch on the north side is not original and probably dates from the 1950s when the dining room expansion and small cocktail lounge were added. The interior spaces retain considerable original fabric, although major changes have been made in interior design and cosmetic finishes. The entrance lobby ("Rendezvous Room"), with its log- slab panelling and exposed log rafters, retains its dark, woodsy character resulting from the deep brown stain on the wood. The ridgepole supporting the log rafters is in turn supported by log poles. Trophy heads of moose, pronghorn, elk, and deer hang on the walls, especially above the doorways to the newsstand, the two gift shops, and the registration area. Copper chandeliers hang by chains from the ridgepole. Most areas of wood floor have been finished with a polyurethane varnish, and heavy-traffic areas have been carpeted. The registration lobby contains peeled log posts with carved corbels that support the floor of the mezzanine lounge above. The mezzanine lounge is an octagonally shaped balcony that overlooks the registration lobby. The balcony railing and those of the surrounding staircases up to the mezzanine and upper floors have balusters jigsawn in a Swiss chalet style. The mezzanine also contains peeled log posts with decorative corbels supporting the beams for the floor above. Hanging from the ceiling of the mezzanine into the registration lobby is a copper chandelier. The layout of the guest rooms has changed to allow for updating, although the double-loaded corridors remain. Although the fenestration is the same as it was originally on the exterior, the rehabilitation of the hotel in 1983 included the addition of private baths for each guest room. The 95 guest rooms now number 79 because of that change in allocation of space. All of the guest rooms have new carpeting and sheetrock, new baseboard electric heaters, and new doors with higher fire ratings. Some of the guest rooms that have balconies have had sliding glass doors with aluminum frames added for better access and easy maintenance. The general configuration of the building has changed little since it was constructed; the biggest changes have been in the building 'ss interior decor. A sprinkler system and new fire escapes have been added to the building. New mechanical systems at the rear (west) of the building are housed in enclosures of log-slab siding. The building underwent a total rehabilitation completed in 1983 that included the removal of all original windows in the upper stories and replacement with thermal-pane windows in a dark brown anodized aluminum. The original windows were paired four- and five-light casements with single-light transoms above, all of wood frame construction. The new casements are single lights with false mullions on the interior. El Tovar's significance lies in its eclectic architecture--a combination of the Swiss chalet and Norway villa as the promotional brochures boasted--and the way in which that transitional architecture bridged the gap between the staid Victorian resort architecture of the late nineteenth century and the rustic architecture later deemed appropriate for the great scenic and natural wonders of the United States. Interlocked with that significance is the building's s importance as the Santa Fe Railway's key structure of its "destination resort" at Grand Canyon which dramatically increased tourism and in turn had an indirect bearing on the area's establishment as a national monument in 1908 and a national park 11 years later. The Atchison, Topeka, and Santa Fe Railway was following the same course that other railroads were at the turn of the century. By increasing passenger traffic on main lines to the west coast the railroads increased revenues. The demand for rail service to the remote western locations like Yellowstone and the Grand Canyon included a need for accommodating the passengers who had travelled so far. The usual length of stay for vacations at that time varied from several weeks to an entire season. The simple camps that often greeted the visitors before rail service were primitive in comparison with the excellent resorts in the east and on the west coasts. The railroads in promoting passenger traffic to these places also assumed the responsibility of building resorts that enhanced the scenic and natural wonders and provided levels of comfort and even luxury that made the trip particularly noteworthy. The stiff competition between the railroads for passenger traffic and the unique locations each served also created the perfect reasons for pursuing types of architecture synonymous with the image the railroad sought to create. 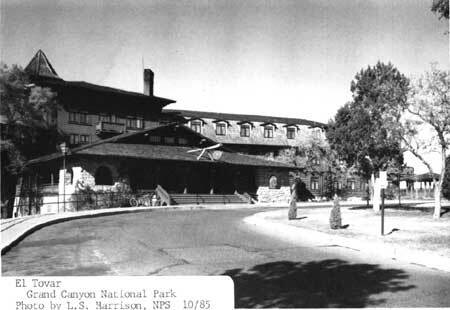 The concept of large luxury hotels was not new to the United States, but the concept of national parks was. The typical luxury hotel in a resort area in the country at the turn of the century was a large wood-frame building with a sprawling plan with applied Victorian ornament for distinction. The construction of Old Faithful in Yellowstone in 1903 altered that architectural concept. The architects and the railroads began using structural materials left in their natural state, similar to the rustic buildings of the Adirondacks. The image that those materials projected when used in that way was of a western, frontier, rustic character. Combined with that was the hold-over of romanticism from the nineteenth century that contributed to the way people perceived and experienced these natural and scenic wonders later set aside as national parks. 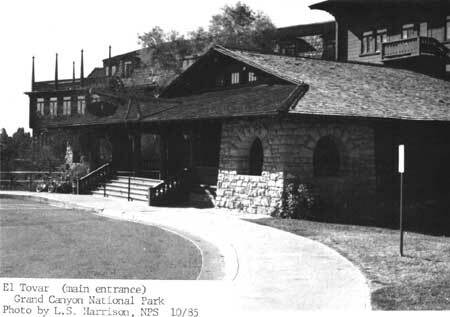 The Santa Fe Railway's extension of a spur to the south rim of the canyon and the knowledge that image, romanticism, and a taste of the western frontier were selling points, resulted in the need of a major hotel that fulfilled passengers ' dreams of the exotic west at that destination resort. The Railway chose one of its talented staff architects as designer of the building--Charles Whittlesey. Whittlesey was born in Alton, Illinois in 1868. He moved to Chicago when he was young and began studying architecture and engineering there when he was only 16 years old. He practiced in Chicago for 25 years, and then moved to Albuquerque as an architect for the Santa Fe Railway for five years, during which time he designed El Tovar at Grand Canyon, and the Alvarado Hotel in Albuquerque. After that Whittlesey moved to Los Angeles and designed a number of noteworthy buildings including Temple Auditorium, the Wentworth Hotel in Pasadena, and a series of commercial structures. He moved to San Francisco in 1907--a year after the earthquake and fire--and designed more commercial buildings there including the progressive Pacific Building--a reinforced concrete structure considered remarkable for its terra cotta ornament and landscaped interior courtyard. Whittlesey was renowned for his early use of reinforced concrete. El Tovar opened its doors in January, 1905, as the luxury hotel at the Grand Canyon for the Santa Fe Railway. The building's style remained steeped in the late Victorian predeliction for the exotic with its roof turret and chalet-like balconies and terraces. Whittlesey's use of log-slab siding and log detailing on the first floor created that rustic frontier atmosphere that the railroad sought. The dark color of the building and the dark interiors contributed to the woodsy ambience. The dark exterior color gave added architectural importance to the building s silhouette--easily distinguishable by its turret and varied roof forms as the most important structure on the south rim by the way it was outlined in the sky. Over the years El Tovar has housed such dignitaries as George Bernard Shaw, Ferdinand Foch, Gugliemo Marconi, Presidents William Howard Taft and Theodore Roosevelt, and even Arthur Fiedler. Once described as "the most expensively constructed and appointed log house in America" the hotel has retained most of its original character. 1 Gebhard, et al., A Guide to Architecture in San Francisco and Northern California (Santa Barbara: Peregrine Smith, 1973), p. 72. Burdette, Robert J., ed. Greater Los Angeles and Southern California: Their Portraits and Chronological Record of Their Careers. Los Angeles: The Lewis Publishing Company, 1906. Davis, Ellis A. Commercial Encyclopedia of the Pacific Southwest, 1911. Partial citation only from Western Regional Office files. Gebhard, David, et al. A Guide to Architecture in San Francisco and Northern California Santa Barbara: Peregrine Smith, Inc., 1973. National Park Service files including National Register files, 1915 Interstate Commerce Commission Valuation by T.A. Hopkins, unidentified article by Howard Bryan from Albuquerque Journal on Whittlesey, all located at Western Regional Office, San Francisco. The irregularly shaped boundary begins at the curb at the southeast side of the entrance drive up to El Tovar and proceeds along that curb in a northwestrly direction to the front of Hopi House (Bldg. 545), then northwest 150 feet to the Canyon Rim, then along the rim to a point 100 feet northwest of the northwest corner of El Tovar, then south-southeast 275 feet to the curb north of Colter Hall (Bldg. 53), then east along the curb 75 feet, then south-southeast 100 feet to the north edge of North Village Loop Drive, then easterly along the starting point. El Tovar (main entrance), Grand Canyon NP, 1985.